I love the Bacharach/David era, especially the soul versions. Those talent shows, the American Idol/X Factor type things always give these songs to people to do. But they always miss the subtleties and complexities. They sound so simple but the melody lines are so precise, so in tune with the chords and more importantly the rhythm of the chords. 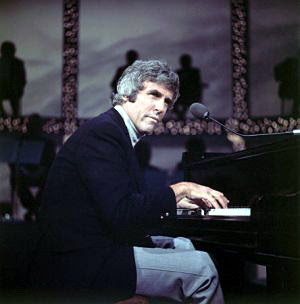 People miss the sense of rhythm that Burt Bacharach has. And Hal David’s lyrics are also very rhythmic. Some fantastic singers have no sense of rhythm whatsoever. It’s vital for these.Having said I love Bacharach; I hate – with a passion – magic moments! It’ll never be too soon if I don’t hear that song ever again. It just grates on my like no other song, apart from mmm-bop…Meanwhile, my favourite Bacharach tune/recording is an instrumental version of Another Spring Will Rise. I’ll have to dig that out and post it. Absolutely beautiful. I’m so glad you included a song from the Elvis/Burt CD from 2000. I have it and frequently use songs from it on mixed CDs for other people. You mention the “Bacharach style” – it’s interesting how his influence has widened from the purveyor of lightweight ballad to a major figure in the baroque/chamber pop genre. Eric Matthews, Belle & Sebastian, the High Llamas – all count Bacharach as an influence. He’s an underrated but important figure in pop music. The Frankie Goes to Hollywood version of “Do You Know the Way to San Jose” was a revelation–I know this band only as the people who foisted the godawful “Relax” on us in the 80s, and I was unaware they had actual talent. Good songs help, of course. And “You’ll Never Get to Heaven if You Break My Heart” is glorious.I’d cast a vote for Dionne Warwick’s version of “Kentucky Bluebird,” which she titled “Message to Michael.” What a superb mix this is. Thanks a lot. The Live Stiffs (1979) album has Elvis Costello doing a very fine version of “I Just Don’t Know What To Do With Myself.” Not a bad song to sing in a punk/new wave/rock and roll concert. Thanks for this mix! I looked all over for that Tom Clay song on CD. Finally found it on an import. It is great. Thanks a lot – great introduction to a magnificent composer … I only knew the Costello/Bacharach CD which iss great. Thanks again, beautiful with all those picture sleeves embedded. Do you have a link that works for Macs? This one downloaded something that needs to be installed to open the files, but it’s for Windows only. Thanks, I love your posts. Greast share, terrific versions of quality songs. Thanks for re-posting. Great post. looks like this needs a repost again… hope you can offer it! thanks! !